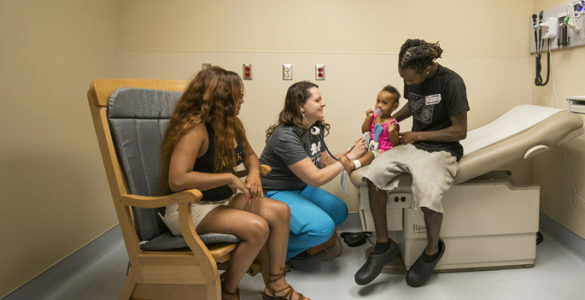 Monroe Carell Jr. Children’s Hospital at Vanderbilt has added seven new rooms to its Emergency Department (ED) to help increase the speed with which the team assesses and treats pediatric patients for minor emergencies. The new ED space, which debuted in May, includes six exam rooms — similar in appearance to regular clinic exam rooms — and one room for uncomplicated procedures/observation. The emergency medicine team will use the dedicated area to treat injuries and illnesses such as simple lacerations, flu, strep, persistent fever and more. Growing demand of emergency care at Children’s Hospital has made the added space a necessity. When an injured or sick child arrives at the ED, the providers will assess the patient for symptoms and determine the best treatment space within the unit for the child to receive care. If the child’s condition were to escalate in any part of the ED — the only Level I Pediatric trauma center within 150 miles of Nashville — the child would have access to the best care and resources for treatment. “The addition of seven rooms to our Pediatric Emergency Department allows for a dedicated space for fast track. This area provides emergency level medical care for patients who have minor illnesses and injuries. Most fast track patients are rapidly seen and can be discharged quickly,” said Cristina Estrada, M.D., director of the Division of Pediatric Emergency Medicine and associate professor of Clinical Pediatrics.